Though the Daily Front Row award ceremonies are relatively new fêtes (New York’s Media Awards began in 2013, while the first Fashion Los Angeles Awards were just last year), they have quickly become fashion event circuit staples—turning out celebrities and industry insiders who want to honor those working behind-the-scenes in fashion journalism. At this year's FLAs, the award for “Editor of the Year” will be going to none other than V99 Guest Editor Lady Gaga. Other winners at this year's ceremony include V96 cover girl Bella Hadid for "Model of the Year," and Carine Roitfeld, who will be accepting "Magazine of the Year" for CR Fashion Book. In an industry overflowing with brilliant and creative editorial minds, winning “Editor of the Year” is quite a feat for someone has only just begun venturing into the competitive realm of magazine editing. To provide some context, previous winners of Daily Front Row awards include our Editor-in-Chief Stephen Gan; Vanity Fair’s Graydon Carter; Carine Roitfeld; photographers Inez & Vinoodh; W’s Stefano Tonchi; Elle’s Robbie Myers; LOVE’s Katy Grand, and more. Even with this being Gaga's editorial debut, she proved herself more than worthy to join the aforementioned league of editors. For the all-star issue, which featured a record-breaking 16 variant covers dedicated to her “Fashion Guard,” Gaga reunited two fashion industry legends (see an unpublished image from this shoot above), paid homage to one of the most influential designers of our time, played house with a mythic cast of actors, acted as muse to her favorite photographers, and had a hand in selecting the next generation of arresting visual artists. All of this and more made V99 into what has become one of our most successful issues to date. High demand prompted not one, but two reprints of the issue. The second edition softbound issues are still available in our red plexi box-set, and the third edition hardbound issues are available for individual purchase or in an ultra deluxe box-set in clear Lucite. Click here to purchase these collector's items, and be sure to go through the slideshow above for a selection of the issue’s greatest hits. The 2016 FMAs will be held this Sunday, March 20. Click here to see the full list of this year's winners. "ADULT FINGER PAINTING" BY LADY GAGA AND TAYLOR KINNEY. "GAGAISM" PHOTOGRAPHED INEZ & VINOODH AND STYLED BY BRANDON MAXWELL. "THE GOOD PEOPLE" PHOTOGRAPHED BY CHADWICK TYLER AND STYLED BY ANNA TREVELYAN. "THE ART OF CURATION" WITH ALANNA HEISS AND KLAUS BIESENBACH, PHOTOGRAPHED BY MICHAEL AVEDON. "DROP ME A LINE" BY YOKO ONO. 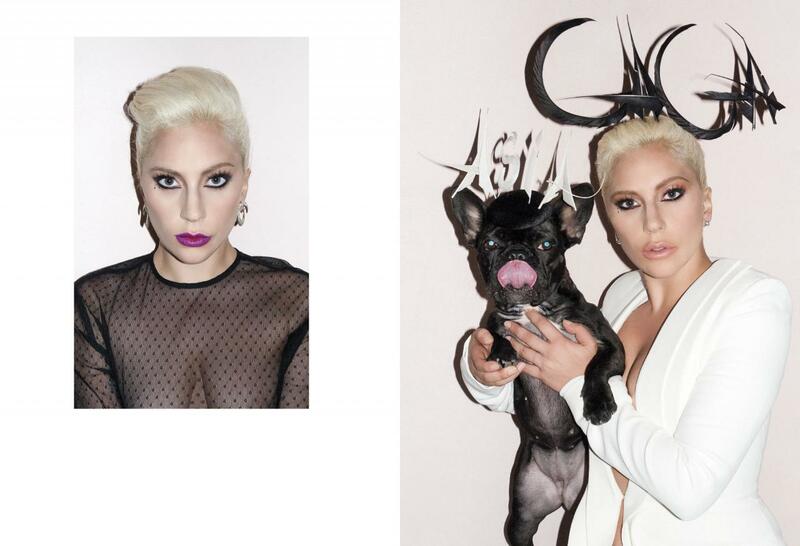 "LEE, ISSEY, DAPHNE, GAGA, AND ME" PHOTOGRAPHED BY STEVEN KLEIN AND STYLED BY PATTI WILSON. "ASIA MAJOR" PHOTOGRAPHED BY TERRY RICHARDSON AND STYLED BY SIMON ROBINS. AN EXCLUSIVE IMAGE FROM "KARL LAGERFELD AND HEDI SLIMANE FACE TO FACE" PHOTOGRAPHED BY KARL LAGERFELD. "THE MOON AND THE CAT'S EYES" PHOTOGRAPHED BY NICK KNIGHT AND STYLED BY AMANDA HARLECH.